All successful people utilize training, a mastermind group and/or a coach to take their skills to the next level. Steve Gavatorta credits his numerous coaches and mentors for assisting him in taking his skills to higher levels. So, Steve would like to extend the same opportunity to you by allowing him to take you to heights previously thought unattainable. Working with Steve gives you the rare chance to be personally coached and developed by a master in personal, and professional development. So take the next step and schedule some time to discuss your specific needs and let Steve, or one of his team help you attain the success, prosperity and mastery you not only desire but deserve. In this one-on-one intensive, Steve, or one of his coaches works directly with you to help discover the best ways for you to personalize action plans to your respective situation so you can achieve your goals. The program starts with a 30-minutesession in which you and Steve analyze and determine your own, unique needs and how to optimize your personalized coaching plan – including goals, content, focus and length of coaching. 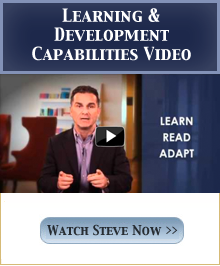 Then you will work with Steve to develop a next step plan of action for your developmental coaching process. One size does not fit all, so your plan will be specific and relevant to you. Contact Steve Gavatorta today to learn more about the Gold Coaching Program. Companies that invested in executive coaching received an ROI of more than 5 times. Training increases productivity by over 22%. However, training with coaching increased productivity by 88%. "I am eternally grateful for the insight and perspective I received from Steve's coaching during our sessions. Not only was Steve able to get me to take a look at myself, he also helped me to see how I am perceived by others. I found Steve to be kind, caring, patient, helpful, and most importantly, flexible. Nowadays, our lives are so hectic. Through our coaching sessions, I was able to slow down, reflect, and redirect. I am now more aware of opportunities and interactions with others. Im also better equipped to make positive change in my life." "Working with Steve has helped me gain an insight into everyone I deal with, from my clients to my managers. When you have an idea of how a person works, you better understand how to approach them." "Working with Steve and applying his in-sites and coaching skills to real life work situations, proved to be the most productive and rewarding work experience I've ever had. Steve is an outstanding coach and a great human being!"